The location of this attraction is prime. Delaware Avenue is home. Furthermore, from the Jet Express boat terminal this attraction is a short walk. Also, the lovely DeRivera Park is just across the street. This park was bestowed to the island by it’s founder, Jose DeRivera. Multiple play areas, picnic tables, fountains and more highlight this space. Lastly, the Candy Bar is next door. This carousel design and construction was by Allen Herschell in 1917. Herschel and his company were responsible for the specialized creation of many amusement rides. These rides included trains, roller coasters and carousels. Furthermore, many of these rides are still in use today. So, guests can ride a piece of history at Kimberlys Carousel. The carousel was purchased by George Stoiber in the 1980s. When he first took possession of the ride, there was much work that needed completed. Of the original 36 horses, only 12 were intact. Additionally, the paint had vanished from most of the structure. Over the course of several years, George and his wife renovated the ride. In fact, George’s wife personally painted many of the horses! Thank goodness they took the time to preserve this treasure. Now, in addition to the preserved horses, they’ve added other whimsical animals. The most notable is “Petey the Perch.” This figure pays homage to one of Lake Erie’s most sought after fish: the Lake Erie Yellow Perch. Fun and whimsy awaits. 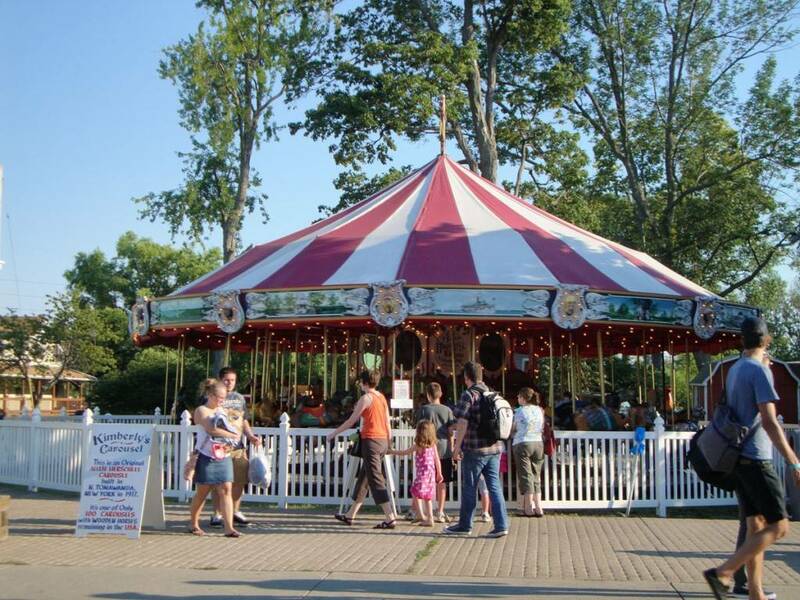 So, be sure to include Kimberlys Carousel on your Put-In-Bay agenda. With rich history and provenance, this is a must see. The children and kids at heart in your group will surely remember their ride. See you at the bay!